A brighter future is in your hands. We’re currently seeking aGroundsperson. You love to spend your day outdoors cultivating amazing landscapes. You treat grass, trees and plots with great care and attention, doing whatever it takes to help them thrive. 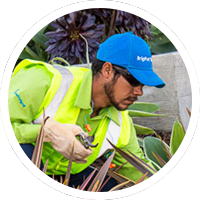 Here at BrightView, we appreciate people with such love for landscaping and greenery. You’ll contribute to the many activities that make grass, flowers and client relationships bloom. Using a variety of equipment such as mowers, blowers, clippers, and edgers to create and prep soil for plant placement. Team members are also responsible for set up and clean up, and taking good care of our trucks and machinery. Applicants must be able to work outdoors, in all weather conditions, doing very physical work, able to lift/carry 35-80 pounds often. You must be at least 18 years old, enthusiastic and dependable, and able to safely work with equipment like power saws and cutters. Previous experience is helpful, but you must have an understanding of landscape basics.